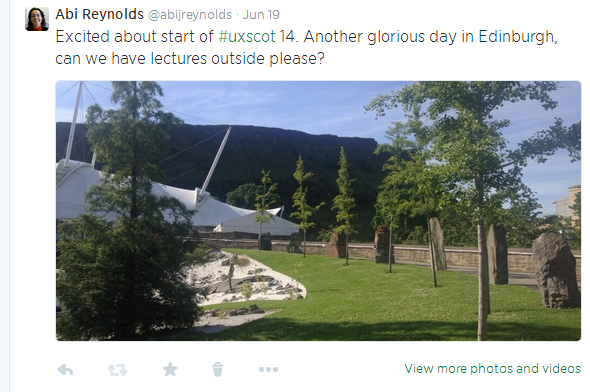 UX Scotland conference organisers brought the sun again this year for UX Scotland 2014 in Dynamic Earth, Edinburgh. And once again we were treated to some interesting presentations, tutorials and opportunities to meet and mingle with other UX Folk. I attended an interesting talk with Stuart McMillian, Deputy Head of E-Commerce from the footwear retailer Schuh. He told us about how Schuh were building an internal testing team. He spoke of Schuh’s ecommerce strategy expanding from a focus on ‘visitor’ conversion to look at ‘cross journey’ conversion. Chrissy Welsh Lead UX Consultant for Backbase continued this theme in her presentation on designing for cross -channel experience. She spoke about four key elements of a usable cross channel experience. Context- specific: understand what is important to users depending on their context and putting this up front and centre when they need it. Once again the focus was on understanding user needs and context of use and designing for end to end experience as opposed to a single channel or device. This drives home to me the point that when people want to do something on “the internet” or the ‘the web” they means to them that should be able to complete their task regardless of how they access the internet be it via web devices, desktop etc. Again, Alberta emphasised designing around user needs and goals and not just around devices or platforms. She does this by focusing on producing meaningful content and producing ‘content aware wireframes’ that specify the maximum amount of words per content block. She suggests chunking content into small, medium and large chunks that can be accessed from any device. And to build content that is device agnostic and rather focusing on meeting users’ needs. I was at a really interesting and interactive presentation from Graham Odds of Scot Logic on designing for innovative interactions. True to the title I loved the way he set up the presentation with his two assistants; one showing interactive gestures from a camera straight to PowerPoint and the other ‘assisting’ Graham as it he magically moved on his presentation from one slide to the next by simply swiping his finger through the air.